Before beginning to write a novel or other narrative, I feel that it is essential to have some knowledge of ones characters and the world in which they exist. Much of the plot may derive from this, from knowing how they will act, how they will react to their environment. Of course, more will (and should) be revealed to the writer once the story itself begins to unfold. Having a solid grasp of who the characters are will make this process much smoother. There is nothing wrong with borrowing from literature or other media to get started on the characterizations, as long as the people who dwell in your created world are not outright clones. Similarly, I will often use pictures of individuals, maybe well-known, maybe random photos found on the internet, to help me visualize my characters. I’ve mentioned celebrities I used in this manner for the creation of my Donzalo’s Destiny reality. It is also necessary to visualize your world itself. This means maps, even in non-fantasy fiction. Sketching out ones city streets in a crime novel is as important as plotting a quest across the mountains to find dragon gold. Yes, I like maps every bit as much as Bilbo Baggins (and his creator) and have drawn my share. 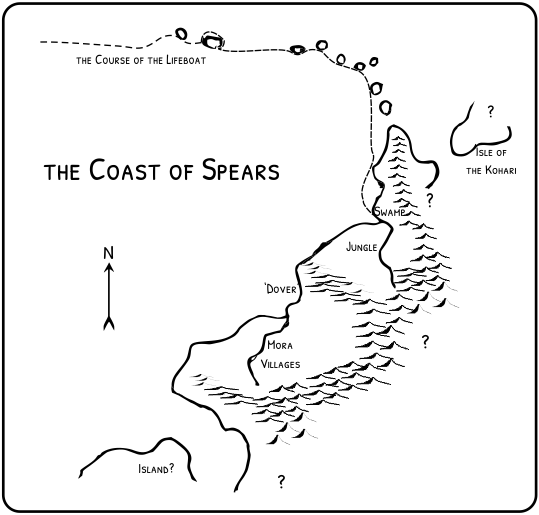 This is one for the novel-in-progress, ‘Coast of Spears,’ (I shall almost certainly keep that title) as it might be drawn by the protagonist. In other words, there is much unknown to him (but not to me!) about the land in which he has been cast up. So, back to writing — I am hoping to have it all finished/edited and ready for print soon. Incidentally, since I ‘build’ my novels in this fashion, with lots of notes and outlining first, I rarely need much actual rewriting. Most problems have been dealt with already! By the way, I created this map (after some freehand sketching) in Corel Draw, although I borrowed and reworked some icons from AutoRealm. I'm finding I don't need a specialized map-drawing program like AR at all.